Doors that do not have two solid blocks beneath them will break when they receive a block update. (For example, trying to place a pressure plate beside them.) Once the door has broken, no other door can be placed there until there are two solid blocks beneath. The door will break and drop as an item. The door should not break unless it's supporting block is broken. Attempt to place a door on a single floating block. The door will appear to place for a split second, but not leave the inventory. The door should be able to be placed on a single floating block. 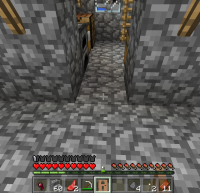 When walking over a wooden pressure plate in Realms instead of opening the door it breaks it. It does not happen in Single Player. MCPE-27765 Doors dissapeared when opened and are not able to be placed where once were. MCPE-27848 Doors broke down by open them. Can't build them again. REALMS-513 Door Placing Fails on Realm instance. Local instance fine.